I have worked with Rick and his crew for the past 10 years. His company provides the experience and knowledge behind the hardscaping element to my designs. Rick and his crew are courteous, prompt and efficient. Rick stands behind their work. My clients become his clients and are VERY SATISFIED. RICK GRUEL - THE MAN FOR ALL SEASONS! We have enjoyed Rick Gruel and his crew since 2001 starting with snowplowing and evolving into just about every service his company offers (and even some not advertised!). These include landscaping, patio, deck, and dock repair, tree service, grading and graveling, lawn care, and a host of smaller jobs that our age and abilities can't handle anymore. Since we are the longest full-time Elephant Rock Road property owners, we have always recommended Rick & company to the next 12 neighbors and the entire road now hires Rick Gruel Landscaping and Design for just about all their needs - 12 months a year. He also handles most of the needs for our ½ mile long private road - graveling, tree removal, heavy grading, snowplowing, and the like. Snowplowing also includes plowing in front of all our mailboxes almost 2 miles away! Rick has an excellent crew. They are polite, trustworthy, work hard and get the job done in timely fashion. Rick is dependable and reliable; he is an experienced expert and outstanding in his field. He is conscientious about contacting us when the necessity to snowplow is questionable and abides by our decision to plow or not to plow. Same goes for lawn maintenance in the summer. We're sure we speak for all our neighbors on all the above-mentioned issues. It's been a real pleasure to write this testimonial. The landscaping turned out great. Thanks for getting rid of those stumps for me. Rick Gruel Landscaping made our office landscaping transformation a breeze. Rick took care of the extensive planning and layouts, as well as worked with two other contractors that were involved in the project closely throughout the entire process. Our office is centrally located in downtown Cable and it is important that we keep our grounds maintained and low maintenance. Rick's work crew was professional and courteous to our visitors as our business needed to continue to operate during landscaping process. From start to finish, Rick Gruel Landscaping exceeded our expectations and left us with quality work that we are proud to show off today and for years to come. Rick Gruels company has been our landscaper ever since we moved to Hayward. He has done some major work for us. He designed and built a 3-tier, 150' long planting bed. Designed and constructed a path down to the lake. Removed over 50 diseased/dead birch trees on our property. Planted numerous trees and bushes. He also does all of our snow plowing/sanding. I am please to provide this letter of recommendation for Mr. Rick Gruel of Rick Gruel landscaping. Both my wife and I have known Rick for the last 14 years. We are both recently retired to our "vacation" home located on Nelson Lake near Hayward, WI. Before our retirement we had employment and another home in Eau Claire, WI, but needed help taking care of all our landscaping and snow plowing needs at our Nelson Lake home. Contacting Rick Gruel was the greatest move we could have possibly made. Over the past 14 years Rick and his employees have provided us with several services, snowplowing for the past 12years, tree and stump removal, driveway gravel, landscape timber installation, below ground level water drain, shrub planting, bobcat site leveling and various other services. Rick has always been professional, prompt, and thorough in the work being completed, and all aspects of the work being performed was done with precision workmanship. Rick has been very dependable and most of all trustworthy. We have entrusted Rick with access to our home in our absences to check on heat power and storm damage etc. This was a great comfort to both my wife and I. 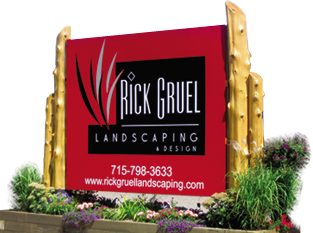 If you want service from a Business that is based on hard working, reliable, honest, employees then we recommend Rick Gruel for all your landscaping and property needs. Rick Gruel Landscaping was willing to work with us and our ideas. Rick's knowledge and many years of experience enabled the project to proceed smoothly and within the estimated budget. His crews were hard-working and always very professional. We are very pleased with both the beauty and functional aspects of our landscape project.